The Coorong Lagoon is one of the most remarkable landscapes in Australia and as you wander north along the shore of the southern lagoon the remote vastness of this huge estuary becomes overwhelming. It matters not whether you look to the south-east or the north-west, the lagoon disappears into the horizon into a haze that appears infinite. The lagoon edge is constantly changing from grey sand to drifts of miniature pink shells; from wind-fretted limestone rocks to smooth shelves of grey calcarenite; from samphire-bedecked flats to yellow beaches as wide as a football oval. And always stretching out into a hazy eternity is the harsh blue sapphire of the Coorong with the gold and olive green dunes of the Younghusband Peninsula beyond. The Aboriginal lands at Bonney Reserve, Ming-in-Unya and Campbells Point are a reminder of the resilience of the Ngarrindjeri who are still a vibrant part of this remarkable area. Mark Point Windmill, remnants of the old Melbourne Road and several stone ruins are testament to the key role that this area played in transport between the colonies. Tragically, South Australia Water will not allow even experienced bushwalkers to cross the barrages on foot so you have to cross the Murray Mouth on a “Spirit of Coorong” cruise. However, after days or weeks of walking this is a welcome respite and a very pleasant way to see the Coorong from a different perspective. 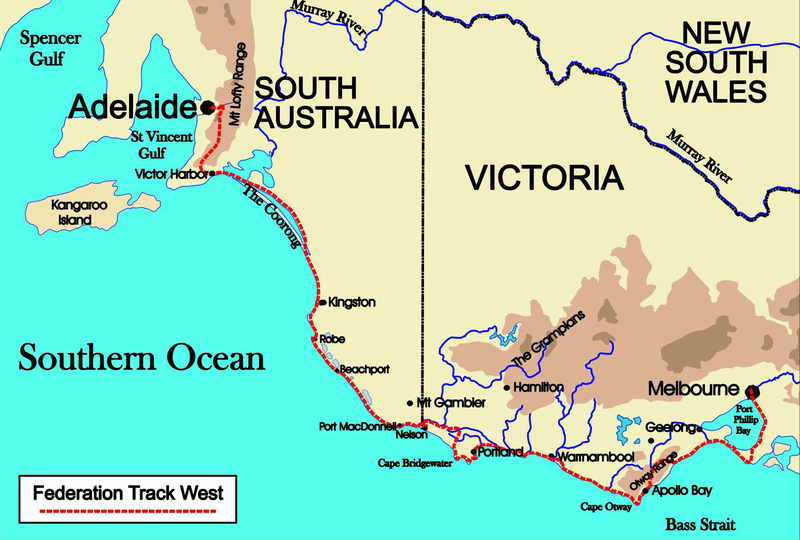 The Federation Track mainly follows the Encounter Bikeway from Goolwa to Kent Reserve in Victor Harbor. At Tokuremoar Reserve this path winds through an ancient swamp with a close connection to the Ngarrindjeri people before wandering along the seafront at Middleton to Basham Beach Conservation Park where the Track takes a more scenic route across Commodore Point and around picturesque Horseshoe Bay. On the western side of Port Eliot there are greatl views across aquamarine Encounter Bay to Granite Island, Victor Harbor and The Bluff with the golden arc of Chiton Rocks surf beach along its northern shore. 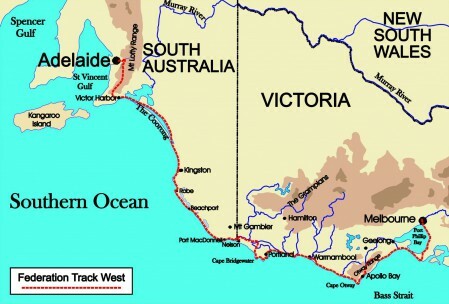 The path runs behind the beach at Victor Harbor to the Causeway with its evocative horse tramway – the last relic of the horse-drawn railway from Goolwa. From the top of The Bluff, the views are breath-taking – north-west along the coast to Newlands Head and south-east along the golden coast to the distant Coorong. The Heysen Trail rises from the coast and runs through tree-covered road reserves and back country roads across Back Valley and Inman Valley where the views in spring are very English. The Trail then climbs South Mt Lofty Range at Sugarloaf Hill to Myponga Conservation Park. Once again, the views on either side of this range are unforgettable as are the wildflowers in the Park during spring.